Recently, I opened several wines from my cellar collection. One was highly rated by a leading magazine and somewhat pricey. It proved disappointing. Another reviewer said he had the same experience with the same wine. Same wine but different bottle on a different day. So no, the wine wasn't “corked” (this month’s hot wine topic). Other bottles I opened were not disappointing, but they were not inspiring. So, like Will Rogers, not finding something good to say, I said and – for a month – wrote nothing. My luck changed with two sample bottles sent from Cultivate Wines. I opened a California red blend called “The Feast.” With the weather changing toward cool and damp, I was ready for a comforting red. “The Feast” is a Merlot (78%) blend with 9% Cabernet Sauvignon, 8% Malbec and 5% Syrah. The smooth and soft-tannin Merlot favorited in this blend makes it an easy transition from summer whites. Red blends are the fastest growing segment in wine sales and “The Feast” is a winning blend. Cultivate Wines carefully sourced their grapes. The Merlot is from Sonoma’s warm Alexander Valley AVA. Its Cabernet Sauvignon is Napa Valley grown. 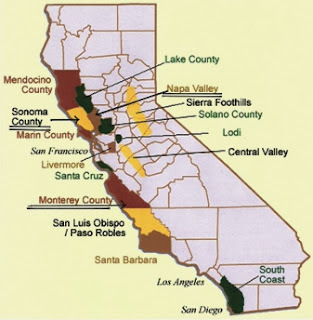 California’s Santa Lucia Highlands (AVA in Monterey County) provides the Malbec. Finally, the Syrah comes again from Monterey Country but from the Arroyo Seco AVA known for its cool climate and gravelly soil. The result is a “Right Bank” Bordeaux style wine from California. In the glass, “The Feast” is dark plum at its core with beautifully iridescent edges. Its nose offers blackberry jam with violet. With air, the wine yielded a faint hint of mushroom. The mouthfeel is rich and pleasantly coating. I tasted blackberry, clove, cocoa and …. and a hint at green pepper? I enjoy wines that challenge, that involve and reward. “The Feast” is that. It has good balance and a medium long velvety finish that invites repeating the experience. At a suggested retail price of only $17.99, that’s going to happen. wood aging. With wine for the 2010 vintage being bottled in early August of 2012, this wine also enjoyed more than a year of bottle aging. Cultivate Wines has produced over 20 wines rated 95 points or higher in the last ten years. Its founders, Ali and Charles Banks, formerly owned Napa Valley’s “Screaming Eagle” brand. You might say experience with that eagle has brought this red blend “home to roost” because at $17.99 “The Feast” provides taste and “Mizer Value” too. * Follow Wine Mizer on facebook for fun facts, recipes and helpful hints. ** Better recommendation: Just enjoy a glass of wine. Thanks for your comment. It's gratifying to know someone cares enough to do so. I'm not certain what you said - it seems not everything came through as you intended. Hope you find the blog helpful. And have a GRAPE day! Received a bottle of The Feast today. Thought I would look into the history first. Reading your blog makes me want to try it soon. Cheers! Hi Donna. Hope you find my reviews helpful and that you enjoy the wine.